Applicable Materials All homogeneous materials which allow transmission of Ultrasonic energy through it like most of metals, hard plastics, glass, ceramics etc. Probe Dual crystal (Transmitter Receiver) type. Velocity 1000 m/s to 9999 m/s. Display LCD type. 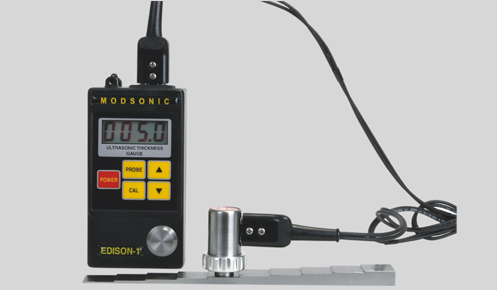 It displays Thickness, Velocity, Battery check, Coupling check, and stored readings with IDs. V- path Correction Built-in for better accuracy. Calibration One step calibration. (for steel). Battery 2 Penlite Dry Cells (AA) or NiCd. Operating time 18 to 20 hours. (with alkaline batteries). Low Battery Indication by Blinking of LCD. Size mm 125(H) x 65(W) x 30(D). Weight 225 Grams (With batteries).